To celebrate 20 years in the music business, Omid 16B and his aLOLa label are releasing some collectable music from the vaults. The re-mastered back catalogue has been made available since 2011 to all good digital stores, alongside the label’s latest brand new music from today’s artists, to show that aLOLa is an exciting and influential label. A process that started two years ago with the first two instalments of aLOLa’s past, present and future mix series was followed in summer 2013 by Mr C’s ‘Volume 3’ presenting his favourite label selections. Now it is time for Omid 16B to finish the year off with ‘Volume 4’. 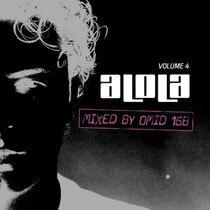 Omid 16B has created a classic mix using purely tracks from his own aLOLa label. ‘Volume 4’ is a good addition to the series of mix compilations, combining forgotten back catalogue tracks with unreleased material by aLOLa artists. Check www.alola.co.uk for more info.